Sheffield is arguably the country’s best place to live when it comes to outdoor sports, with people moving here from all over the country to make use of the unique landscape and supreme facilities. 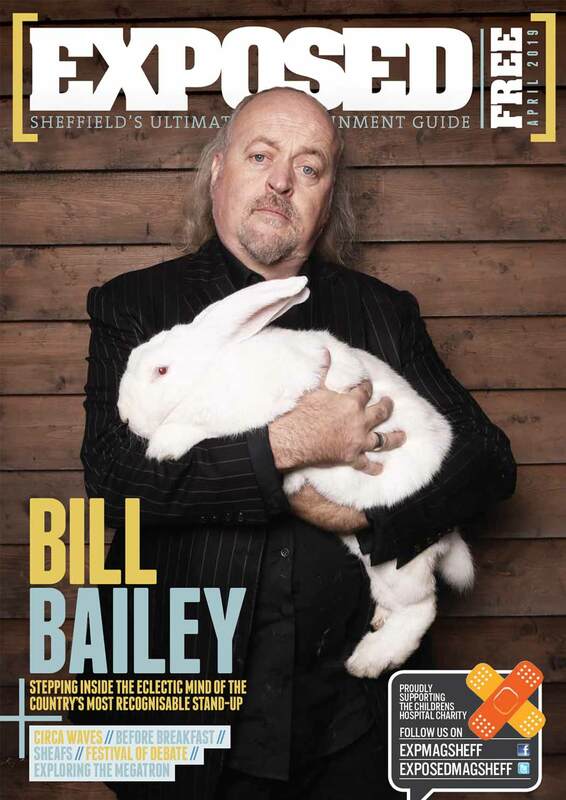 So whether it’s scaling sheer rock faces, racing rivers down valleys or simply strolling along hidden waterways, we take a look at some of the highlights and meet some of the people that have made Sheffield ‘the outdoor city’. Perfect for beginners with its flat ground surfaces and range of free-standing boulders, Burbage Valley is appealing to all and makes for a great family friendly day out. Here you will encounter views across the valley from the Iron Age Fort of Carl Walk as well as its popular neighbouring climbing destination, Higger Tor. Lying just seven miles outside Sheffield city centre, the valley is within easy reach and what’s more, its real sweet for the summertime; the scent of fresh honey lines the air and the hills turn purple – certainly contributing to the satisfaction one feels when completing this beautiful Burbage climb. Cratcliffe Tor is in an extremely rural setting with a view out over tranquil farmland with a small but superb set of climbs. The main event? The sheer walls of Owl Gully; here, the many breaks offer fine climbs often traversing out of the gully into impressive positions on exposed faces, with plenty of protection offered by breaks. Around the corner from the gully is the dramatic tall face tackled centrally by Suicide Wall. Located south of the main edges, and lacking much in the way of quality climbs in the lower grades, it is seldom busy, though the area is popular as a bouldering venue. The most famous Tor in the peak, with an internationally lauded reputation, Raven Tor is known as the ‘national crucible’ of hard sport climbing for its many dramatic hard routes. Notable routes include The Prow, Revelations and Mutation. Despite being a steep, limestone crag, the routes are hard and bouldery, requiring explosive fitness as opposed to sustained. The only disadvantage of this iconic rock? It’s a real suntrap and can be far too hot! 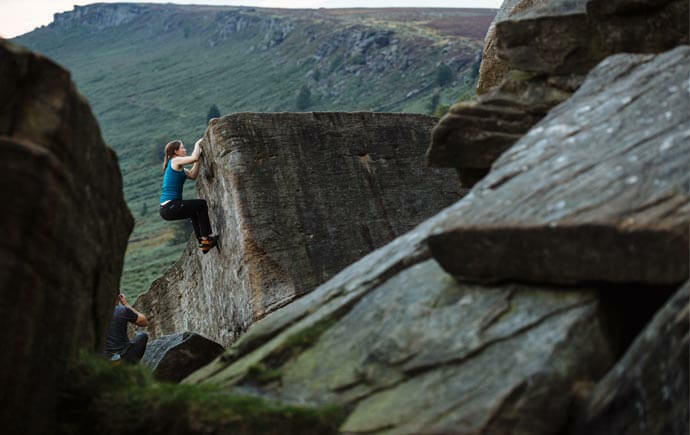 Attracting climbing enthusiasts from all around the world, Stanage Edge is very impressive – stretching six kilometres and situated just north of Hathersage Moors, it is the ideal place to bring your family and friends for a good range of gritstone climbing. What makes Stanage truly spectacular though, is the scenery you will encounter – the moorland cannot easily be matched while the rolling green hills and bursting treetops will be sure to leave you breathless. Located just half an hour from Sheffield city centre, lovers of the classics will be interested to know that it was here – at the very top of the Edge – that Kiera Knightly iconically stood in Pride and Prejudice; so why not go to have your very own Elizabeth Bennett experience? Whatever your reasoning, be sure to pack your camera – the view from the top is one you’ll want to remember. Want to practice your climbing in the safety of a dedicated centre before heading into the Peaks? Then you are spoilt for choice in Sheffield. As the UK’s first dedicated climbing wall, The Foundry is part of the Sheffield furniture. With courses available for complete beginners to those who are experienced and wish to improve, coach, or be assessed, there is something to suit everyone at The Foundry and it’s the ideal place to try something new. The Foundry isn’t limited to just the traditional indoor climbing walls either, once you have tackled this, the centre provides outdoor adventures with trips to offer the ‘Gritstone Experience’ where you will be able to climb at sought after locations within the Peak District alongside skilled instructors with over 30 years of experience. Plus, if you fancy just a taste of what climbing can offer, the centre caters for private instructed sessions for people of all ages and abilities. So, whether you are a keen climber and wish to encounter the high standard facilities the centre provides, or, if you simply wish to experience the freedom and rush that comes hand in hand with climbing for the first time, you’ll certainly be in capable hands. Awarded the ‘National Performance Centre’ by the British Mountaineering Council, Awesome Walls is known for its first class climbing quality. The centre is accessible to all and provides a four week course to introduce beginners into the world of climbing or develop the confidence of those wishing to take their skills to the next level. Courses include ‘Resin to Rock’ which aids the transition from climbing inside to tackling the rocks outdoors and ‘Lead Taster’ – an opportunity to get to grips with the most advanced form of indoor climbing. It’s also good value for money – the four week course comes in at just £80, whilst day events and tasters are available from just £15. With a possible 312 routes to explore across 104 lines, two bouldering areas and a dedicated Auto Belay zone for single climbers, it’s fair to say Awesome Walls lives up to its name. 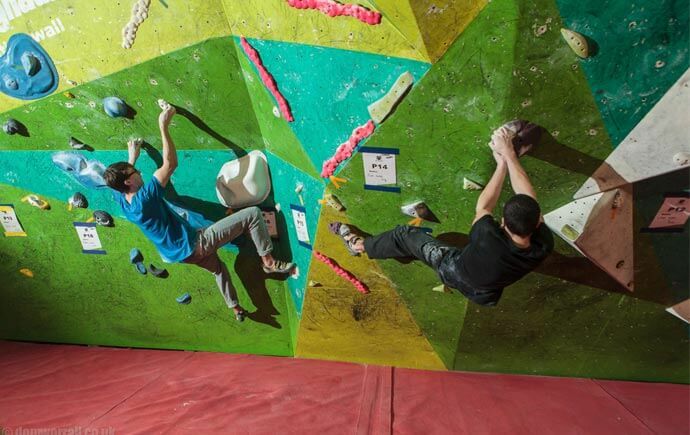 Dubbed as the world’s best (and largest) bouldering centre, The Climbing Works is the ideal place to specialise in this specific area of indoor climbing. Whether you’re on your way to becoming elite or have just climbed your first few steps, the centre provides everything from classes and courses to one on one coaching. So, what exactly makes bouldering so great? Some say it’s the unique freedom you achieve, no ropes, no gear, just you and your natural ability to climb. Others enjoy the fact that you can do this entirely alone and set yourself mental and physical goals that will in turn make you a better climber overall. Typical courses teach you the methods of balance and route reading and progress onto how to hone your skills through the more challenging circuits. Open every day this summer, The Climbing Works provides the perfect opportunity to uncover and develop your love of bouldering! This route starts you off in Oughtibridge and takes you down through higher and lower Bradfield, where highlights include the Church of St Nicholas and the cricket pitch. Follow it down through Loxley, the Rivelin valley and towards Fulwood onto Ringinglow Road, where picturesque views accompany you as you edge towards the Hope Valley and back towards Bradfield as the route finishes. 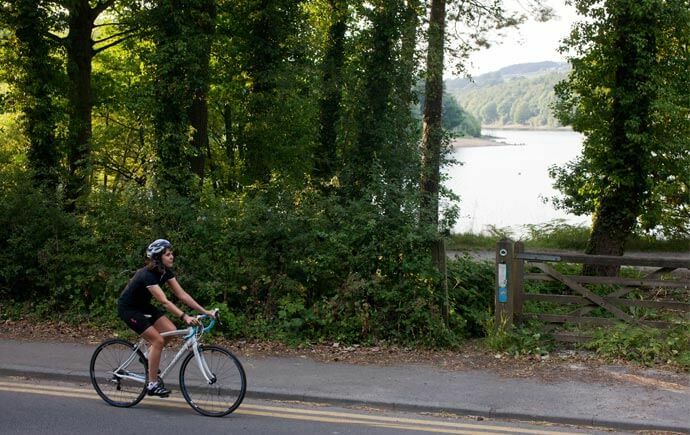 Ladybower Dam is one of Sheffield’s most idyllic spots – with crisp water, plenty of greenery and not much in the way of traffic, it’s perfect for a family day out or a solo ride with you and Mother Earth. Start off at Ladybower Inn: be polite, give them some custom and you might be able to get some parking out of them. This route can be taken long or cut short depending on the circumstance – I myself prefer to head out with my family, shorten the route and take in the views. A word of caution: this one isn’t very family friendly. A real road route, this one starts out in Crosspool, before it descends down away from the city and through the Rivelin Valley onto Manchester Road. The real cycling begins when you get out into the moor – you’ll turn off the A57 and back towards Bradfield, heading up the hill to loop up and around Dale Dike Reservoir and down towards the Strines Reservoir where your reward is waiting – the famous Strines Inn and it’s muster of peacocks. Tapton Lock to Rother Valley, this route follows the winding Rother River across the doorstep of Derbyshire and back into the outskirts of Sheffield. For those who enjoy a leisurely ride, this is for you: the route passes through the picturesque village of Staveley, where you can take a break along the way and enjoy places like the Hawskhead Brewery, an ice cream parlour or – a favourite of walkers along the route – Wilf’s Café. If you want to see a bit more of the city, then how about this route which takes in all the Sheffield Wildlife Trust sites in central Sheffield? It starts at the Winter Gardens and takes in Division Street, Meadowhall, the Five Weirs Walk and Kelham Island. It’s a great way to see the city from a different perspective and if you’re after a bit of liquid refreshment, you’re spoilt for choice in terms of the local hostelries. 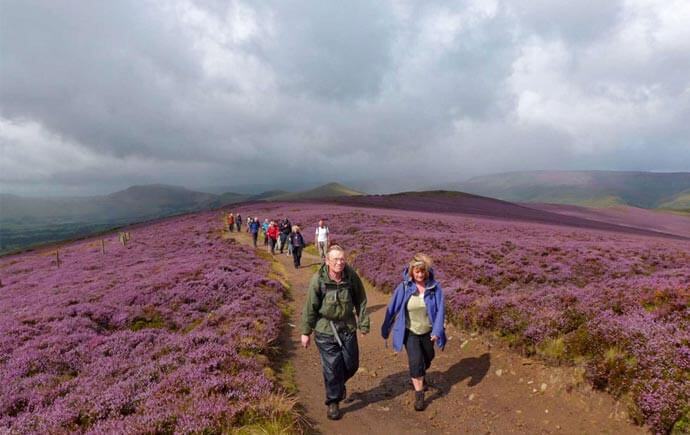 With over 30 routes available varying from ‘easy’ to ‘strenuous’, Sheffield Walking Festival is the perfect way to enjoy our outdoor city. Returning this year on 8-17th September, the Festival allows you to discover all corners of Sheffield and you’ll be spoilt for choice with the amount of options available – from historical trails such as ‘The Sheffield Civil Rights City Centre Walk’, to classic countryside walks along the beautiful bordering Peak District, the Festival has something to suit everyone. So lace up those walking boots and get exploring! The Outdoor City’s urban cyclo-cross series, which combines edgy urban architecture with daredevil cyclo-cross and mountain biking returns next month. 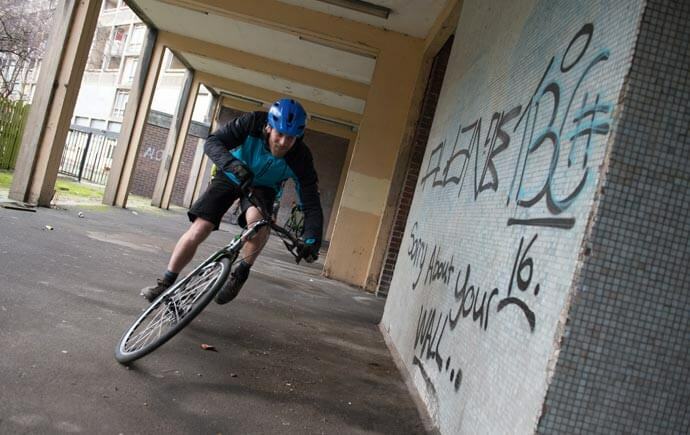 After the success of KICX where riders battled it out over the Kelham Island cobbles in May, Urban CX is coming to the concrete streets in the sky, Park Hill Flats – PHCX – on Saturday 16th September, from 10am-7pm. There isn’t a better spot to overlook the city centre and watch the action unfold. Whether you’ve just started racing or are extremely experienced, everyone is welcome to join in with a choice of four different categories to sign up to.